Green Curry Recipe is one of our low glycemic recipes! Does a Thai green curry recipe fit into your quest for all foods low glycemic? This is absolutely right for a "low blood sugar way of eating" for a number of reasons. You will be getting some good omega 3 fatty acids with the fish and this recipe is very filling. There are no high glycemic carbs in it and the protein in the fish will keep your blood sugar nice and even. This is so ambrosial it is one of our printable low glycemic recipes so you can print it out cleanly and add to your collection. My daughter-in-law is from Thailand and she is adding to my repertoire of recipes each day. As I find the simple ones that I can include with our low glycemic recipes you will find them here. Start your rice cooking about 40 minutes before you want to eat. The green curry recipe itself is fast and simple. Simmer gently all the ingredients together except for the rice and cilantro for 20 minutes. The fish should be cooked through. It should look slightly green from the curry paste to be really flavorful but adjust the curry paste for your taste. It should be thick enough to be a sauce for the rice rather than a soup. Turn off your rice after about 40 minutes (read the package directions) and chop your cilantro. You will spoon the curry over the rice and sprinkle cilantro on top for a quick, healthy, delicious lunch or dinner. It will also keep nicely a few days if you are making it for one or two people and you could even pack it for a lunch if you use a cold pack. Thai recipes fit very nicely into the low glycemic way of eating because they revolve around vegetables as the main attraction rather than meat. Meat is a part of most dishes but in much smaller amounts than westerners usually eat. The other sticking point, no pun intended, is that rice is very much a part of the Thai cuisine. Actually, you need to be sure that you don't have "sticky rice" by overcooking it. The longer rice is cooked, the higher the glycemic response. Traditional Asian rice is an unrefined grain that contains essential nutrients. The reason white, industrially refined rice is high glycemic is because the fiber and all the nutrition, the bran and germ are removed. Use whole grain brown rice which has a moderate glycemic index or if you like mix it with a high quality white rice and cook it in a rice cooker. You may need to add extra water to get all the grains cooked. Parboiled high amylose rice has a lower glycemic index. Look for Asian brands in the specialty section of your grocery store or locally grown rice in your natural foods store. Coconut milk is controversial when it comes to maintaining fat loss because of it's high fat content and the fact that it is saturated fat. We need some saturated fat in our diets and a plant fat is a great source. If it's too rich for you mix it half and half with water. It contains medium chained fatty acids and will actually help with increasing your metabolism. The coconut plant is a staple food in many cultures and is highly nutritious! It is rich in fiber, vitamins and minerals. Because of it's high fiber content it seems likely to me that it is low glycemic although I don't believe it has been tested. It does contain very little carbohydrate, just 1 gram in a 15 gram serving. This green curry recipe is so rich, yummy and filling you will not be tempted to eat more. You could eat it for lunch and have something lighter at dinner. Remember that good fats do not make you fat. You could serve it with a Thai green salad and a Thai salad dressing and finish your meal with some fresh oranges or grapefruit split into quarters. 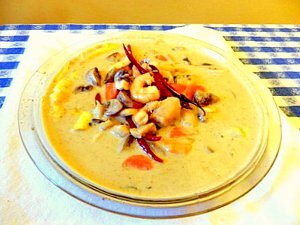 Return from Green Curry Recipe to Low Glycemic Recipes. Return from Green Curry Recipe to Lifetime Fat Loss home page.